Ring side seats for Sydney Harbours most impressive day. Join us for one of our most popular Sydney harbour lunch cruises on Boxing Day! Get the perfect viewing spot of the Sydney to Hobart yacht race from our indoor and outdoor viewing decks. You will see the full fleet of yachts with an unobstructed view and it really is the only way to truly feel the spirit and excitement of this internationally renowned race. The Sydney to Hobart race is a spectacular day out on the harbour and the starting point for a race, which covers 630 nautical miles and has been running annually since 1945. The cannon blast signals the start of the event and it is a real treat to be out on the harbour when the race begins. If you are looking to relax and enjoy the harbour at it’s most impressive, then gather friends and family for an experience which will be remembered for many years to come. There is a freshly prepared lunch buffet to suit all tastes and a fully stocked bar to keep you refreshed. Our custom built catamaran is also fully air-conditioned and you can watch the yachts sail by from through our large viewing windows while keeping cool and out of the sun. 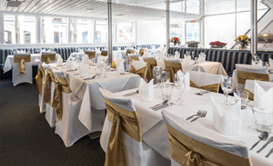 Package Includes: Buffet lunch freshly prepared on board by our Chef and drinks package.